Confronted to the difficulties of daily life, the consumer is looking for pleasure and well-being through food. Kidults forget about stress and responsibilities for a moment, just the time of a greedy parenthesis where the quality of the products does not matter: only the comfort provided matters. Food becomes an easy way to find pleasure and reassurance. 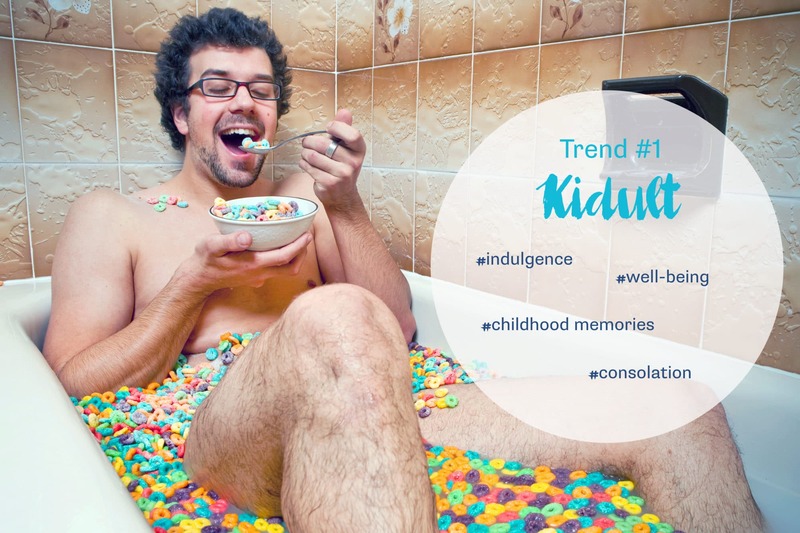 Kidults particularly appreciate fat and sugary products that will allow them to relax. The portions are generous and greedy. Sweet delicacies become trendy: Les gourmandises sucrées deviennent tendance : donuts, cupcakes, macarons… Plenty of shops and cafes emerge, nurtured by that craze. Surfing on that new consumption pattern, some brands do not hesitate to play with references to childhood to give a feeling of nostalgia to consumers. The brand Bonne Maman is a good example of that inclination. In London, the opening of the bar Cereal Killer Cafe – that offers more than 120 kinds of cereals to breakfast lovers – also illustrates that new devotion to childhood memories, that Kidults try to find through food.